The transit of Io and its shadow tonight were a great opportunity to try out the ZWO ASI120MC camera on a planetary target. The skies were mostly clear and steady, although the transparency is variable fair to poor. With the new easily adjustable wedge it was much easier to do a real drift alignment. Framing and focusing were a bit slower than with the large APS sensor Sony a6300 with its excellent focusing aids, but not too difficult. I used a Dakin 2x Barlow and data capture went smoothly. Io's shadow is clearly visible at 2 o'clock near the right limb and Io is the yellowish spot visible to the left of its shadow. The great red spot is lower on the right limb just about to rotate out of view. Image taken at 2017-04-03 05:30 UT from Austin, Texas. Questar 1350/89mm telescope with a Dakin 2x Barlow and ZWO ASI120MC camera at prime focus. 2000 images exposed for 75 msec at a gain of 49. The best 128 images were stacked and deconvolved in Nebulosity. Final crop and exposure adjustments in Photoshop. All processing was done in my driveway under the stars :-). 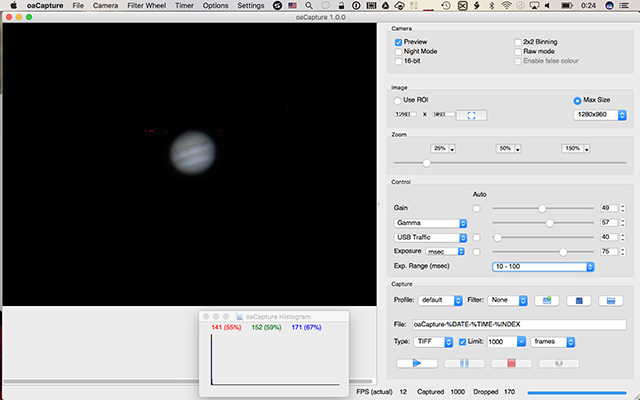 I used oaCapture 1.0 from the Open Astro Project for live view, camera control, and image capture; running on macOS Sierra. It is working well for me other than a minor interface bug and a memory leak while previewing the live view image. Both are easy to work around and have been reported to the developer. I've reworked this image with a better stack using Autostakkert 2 virtualized under macOS and with a lighter touch in post processing. 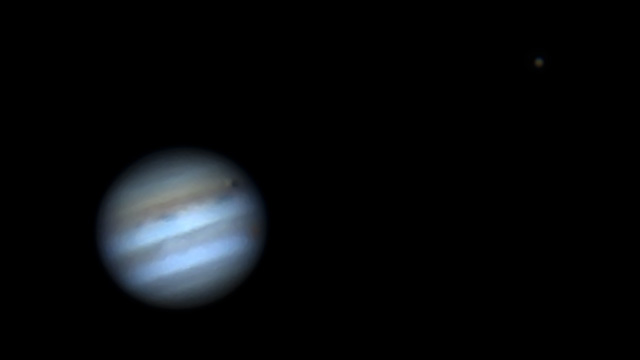 The improved image now includes Europa off to the right. Io, its shadow, and the Great Red Spot are all near the eastern limb of Jupiter. Europa is off to the right. Image taken at 2017-04-03 05:30 UT from Austin, Texas. Questar 1350/89mm telescope with a Dakin 2x Barlow and ZWO ASI120MC camera at prime focus. 2000 images exposed for 75 msec at a gain of 49. The best 64 images were drizzle stacked in Autostakkert 2 and deconvolved in Lynkeos. Final crop and exposure adjustments in Photoshop..